Saudi Arabia: Celebrating Women Now Allowed To Vote! 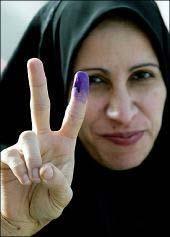 Saudi Arabian King Abdullah has granted women in his country the right to vote and run for public office. Not so much hooray- in order to participate in public life, women still need permission from a male relative. They also won’t be able to start participating in the democratic process until the next election cycle, which won’t happen until 2015. “I haven’t been able to take my breath,” said Hatoon al-Fassi, a university professor and women’s rights activist in Riyadh. “I’m very happy about it,” said Mohammed al-Zulfa, a former member of the Shura, who has long sought greater freedoms for Saudi Women. Some speculate that King Abdullah enacted these reforms in response to progressive political pressure from elsewhere in the Arab world. Others think that the grassroots “drive-in” protest that Saudi women participated in earlier this year may have influenced the King. No matter the cause, this movie is a major step forward for half of the population of a country that isn’t exactly renowned for its stellar record on human rights. Saudi Arabia, for example, is the last country in the world that bars women from driving. Saudi women weren’t allowed to be educated until the 1960’s, and lower class women in the Gulf state still face a harrowing set of circumstances. I’d extend my congratulations to the government of Saudi Arabia, but congratulating the government on almost approaching the bare minimum for its women seems a little like congratulating the Ben Roethlisberger for going an entire off season without groping anyone. CLICK PHOTO for RELATED ARTICLE. wow,madam,what a lines?really strong n seems all de women will get some knowledge after reading your writings on the wall.well, has to educate more…..cos,many womens are still lying behind even in our country. We will keep working until we have made a change. ALL human beings are equal, and until those in power understand this, we will always have to prevail, and work for justice for all. Of course, this is great news. But they still face prosecution if they drive a car. So sad, so sad. Of course this is good news for us all democratic and pluralistic minded people.Women are allowed to vote the question is whom the will vote?Are there many political parties? Is the country running following democratic process? Sorry to articulate here that there are a lot of women empowerment process e.g. Political,Social,Economic and Education.The perfect entry level for women empowerment is the basic education then the others.The Saudi Government allowed their women to vote,this only simple part of women. When they will enjoy all entitlements from their family to state level then we can say they are empowered.Otherwise it will not be empowerment. Nevertheless,the process of empowerment beginning in the Kingdom of Saudi Arabia & be continued and be achieved the target of empowering the women when they will come to administration,they would enjoy all their rights and entitlements according to the Muhammadan Law,they would come to legislation,they would be able express their opinion publicly,they would be able take part in the planning and implementation process starting from family to state level. In today’s world and I don’t think really what part of the world you live in, women should be heard, counted, respected and not made to walk three steps behind any man for any reason! Congratulations on this step for our Saudi Arabian Sisters. It wasn’t too many generations ago that American women were fighting for the right to vote. We still have a long way to go, worldwide in regard to Equal Rights. This is a step in a positive direction and great news to hear! It is a great news indeed Thank you King Abdullah.